Close to town is a great asset. Walking distance with 2 kids which is great when Noosa is really busy during peak holiday season Neat and tidy and great hosts. Only downside would be lack of a dishwasher! Comfortable and Clean Great Location easy to find, easy to book in, especially as were late. very clean and tidy with good amenities and a superb location, close to everything we needed. Just like smashed avo on sourdough and binge-watching your fave TV shows, travel is one of the best things in life. And if your adventures take you to Noosaville, you'll find a seriously amazing range of hotels to pick from. Whether you want something fancy or low key, there's plenty of choice here. 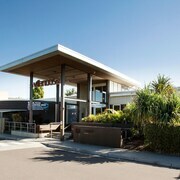 lastminute.com.au has 106 places to crash all within 5 kilometres of downtown Noosaville. 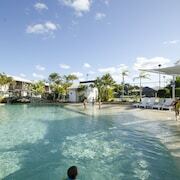 After checking out all the sights, laze about in bed at Noosa Keys Resort or the Verano Resort. They're both a hop, skip and jump away from all the action. 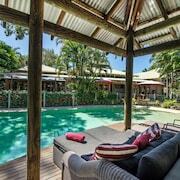 The Noosa Outrigger Beach Resort and the Clearwater Noosa are also well worth your time. Hastings Street features 15 accommodation options. This area is 4 kilometres from the downtown streets. The Fairshore Noosa and Netanya Noosa come highly recommended. Slap on your most stylish golf clothes and play a few rounds at Noosa Springs Golf Club. 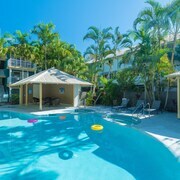 RACV Noosa Resort and The Rise Noosa are two convenient options if you and the gang are keen to stay in the vicinity. Relax with the kids at Noosa Marina and listen to the tide go in and out on the waterfront. You can spend time at it whenever you like, especially if you're staying at the Portside Noosa Waters and Noosa Lakes Resort. After more options? The Oceans Mooloolaba is situated 30 kilometres away from the downtown area, and the Eumarella Shores Noosa Lake Retreat is 3 kilometres away. If those choices aren't up your alley, you may prefer the Alexandra on the Pacific or the Maison Noosa Beachfront Resort. Still haven't got the ideal room? You might just find a lavish enough thread count in Eumundi. You'll also be able to have some adventures at the Ginger Factory and Eumundi Market. 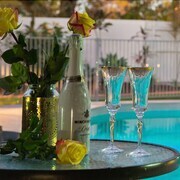 The Noosa Valley Manor B&B Retreat and Alexandria Retreat are a few of the short and long-stay options here. 12 kilometres to the west of Noosaville you'll find Lake Macdonald, home to the Alaya Verde and Cooroy Luxury Motel Apartments Noosa. While in Lake Macdonald, set aside a little time to visit the Tewantin Noosa Golf Club and the Noosa Botanic Gardens. After being cramped in a cabin seat for hours, a warm cosy bed at the Sand Dunes Resort will feel heavenly! If that doesn't quite cut it, check out the Santorini Twin Waters. 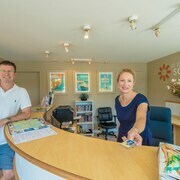 Both are pretty much on the doorstep of Sunshine Coast Airport, which is 20 kilometres from the centre of town.